My royal ladies and I had the honor of helping out at the Special Olympics Christmas Party, which was at the South St. Paul VFW on Sunday December 6th. It was a lot of fun because we met so many different people who were all really nice! 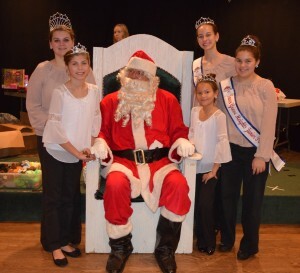 Another thing that made the event fun was that Santa came. He brought gifts for all of the athletes too! Also, something that meant a lot to us was when we signed the poster thanking veterans. It was awesome seeing so many words of appreciation on the poster for all of them because they give so much to our country. With Stephanie planning on joining the Navy it meant that much more to us too. No matter how much time a veteran spent in the service, their dedication and hard work is greatly appreciated!